Poetry with Marilyn Annucci, reading from "The Arrows That Choose Us"
In The Arrows That Choose Us, Marilyn Annucci's poems of quiet observation startle with their precision: a curmudgeonly crow trapped in a yard "spreads his wings like a set / of black cards"; the knife at the bottom of a dishpan is "a mute battleship gone down on its side"; Houdini is "holding his breath in your bathtub." Metaphysical in scope, this collection offers meditations on intimacy and mortality, technology and luck. Annucci finds humor even in places of loneliness or disappointment , reminding us how "the arrows that choose us" never fail "to tear us awake." 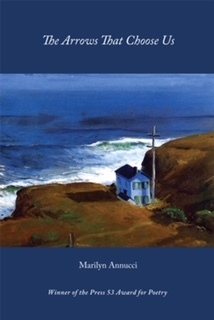 For more about Marilyn and her poetry, check out her website.